There are some 50 species of rhodiola, however it is the fragrant root of the species rhodiola rosea that is used medicinally. 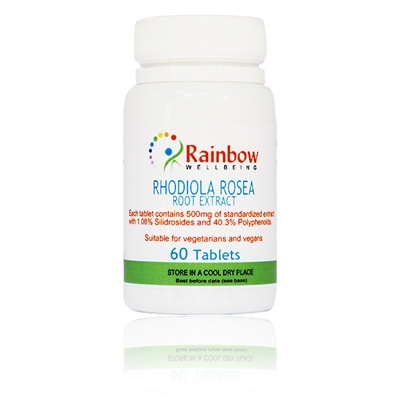 Rhodiola has a more stimulating effect at lower amounts, and a more sedating effect at higher amounts. In medical treatment, the daily doses depend on the strength of the extract. There are numerous animal and test tube studies showing that rhodiola has both a stimulating and a sedating effect on the central nervous system; enhances physical endurance, improves thyroid, thymus, and adrenal function; protects the nervous system, heart, and liver; and has antioxidant properties. Adaptogens are herbs that help normalise body chemistry and help increase resistance to or adaptation to stress of all kinds. 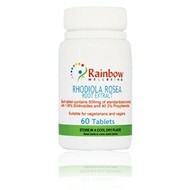 People taking Rhodiola exhibited increased levels of Beta-endorphin, a stress relieving, feel-good, analgesic peptide. Take 2 Tablets daily, as a food supplement.